Another solid performance from local stocks today bucking the negative overseas lead – the Dow Jones down -146pts / 0.61% overnight yet we rallied +0.54% today continuing our recent period of outperformance. The banks the main driver which would have come as a surprise to some (not MM) with the big 4 contributing +22 index points today. The headlines were negative this morning with Scott Morrison targeting CBA following APRAs move to increase their capital requirements by $1bn – a big number on face value however for CBA it means an increase in capital requirements of around 0.30% at a time when they are well capitalised – not huge although it made for some good headlines this morning. 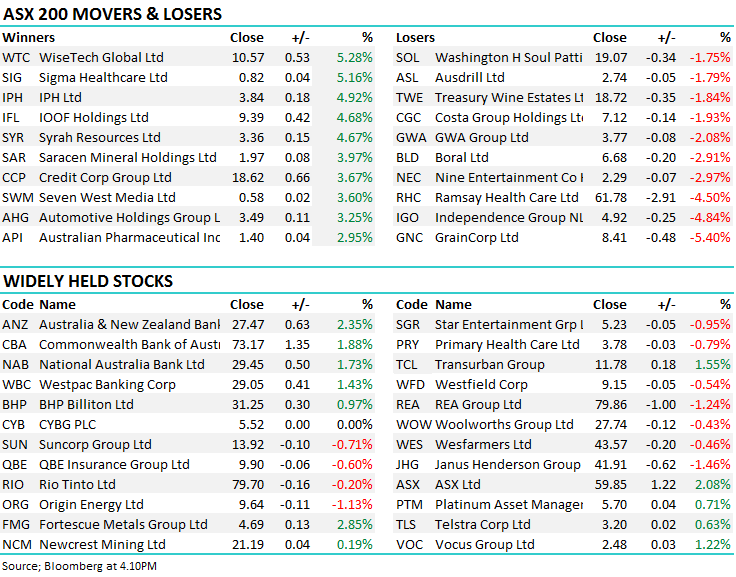 CBA actually ended the day higher by 1.88% to $73.17 while ANZ was also strong, rallying 2.35% to close at $27.47 after reporting an inline first half result – more on that later, however it clearly highlights the current bearish positioning towards the banks, where expectation ‘meets’ equate to strong share price gains. 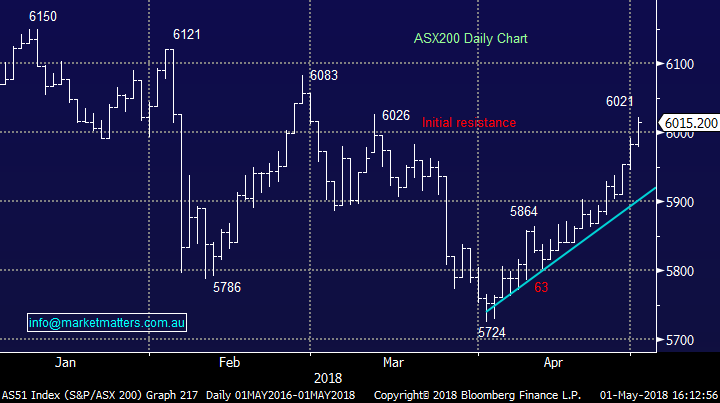 Overall, the ASX put on +32points or +0.54% today to close at 6015, the Financials the strongest link – 6250 clearly in our sights! Broker Moves; Macquarie Group was in the sights of two brokers overnight with both Bells and Evans downgrading the stock into recent strength. Not surprisingly the stock took a hit this morning however recovered well late in trade. We have Macquarie in the Platinum Portfolio targeting $110 – the stock closed today at $107.72, down 0.89% after trading as low as $106.31 in early trade. 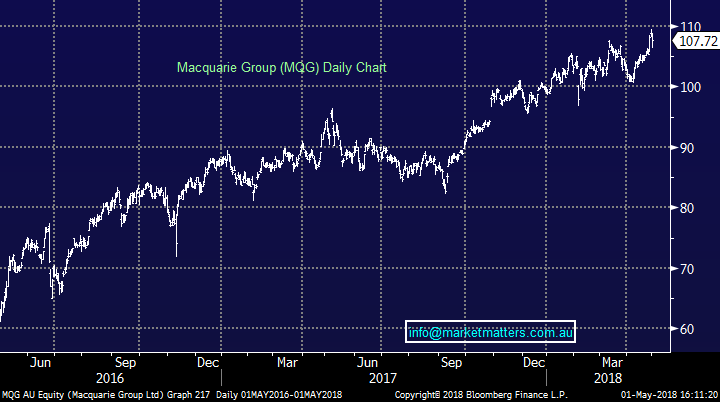 Staying on Macquarie for a moment, the investment bank has good momentum however a couple of points reinforcing our appetite to SELL around $110. MQG is cheaper than the market, trading on 14.3 times with many sighting that as the reason / along with good growth to own it. MQG though usually trades around 13.5x so it’s starting to get a bit expensive based on current earnings forecasts – as the PE graph shows below. Trading on 13.5x to stock is worth $102.95. In bullish times MQG should trade at a premium and in weak times a discount. Right now the mkt is doing okay justifying the premium, however Macquarie is a high beta stock and will turn sharply if / when the market does. Also worth looking at valuations to overseas comparables below. MQG screens slightly expensive. While we like the stock, selling into strength makes sense. 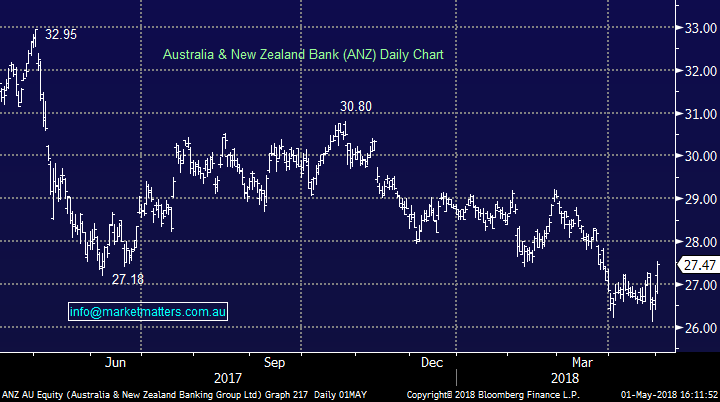 ANZ Bank (ANZ) $27.47 / +2.35%; ANZ announced their half year result before the market opened this morning with numbers coming in broadly inline. Underlying profit of $3.3bil, which excludes any contribution from the pending business sales, while bad and doubtful debts remained at historical lows helping cash earnings rise to $3.5bil. The dividends remained unchanged at 80cents for the half, which was in line with consensus. ANZ remains a turnaround story, and will be a capital return player in the near future by the look of their current balance sheet - teir-1 capital at 11%, and expected to be closer to 12% by the time asset sales are completed. We reckon ANZ will look to pay higher or special dividends, or launch a buy back later in the year. Clearly ANZ, like the rest of the banks are stuck in what everyone is saying as a low growth phase but they still managed to show loan growth in Australia of 4%. The move in ANZ today, and the banks alike, highlights how cheap they are, and how little the market is expecting from them. Banks – Relative valuations – the market hates them, ever the Treasurer seems to hate them and probably rightly so , however from an investment standpoint, the vortex of negativity surely creates a buying opportunity?? Independence Group (IGO) $4.92 / -4.84%; The nickel miner released their 3Q update last night (sneaky) which notably missed guidance / market expectations in key areas, despite growing significantly on the previous quarter. To reach the consensus EBITDA number for the year, 40% of the final figure will have to come from the fourth quarter – which is massive. Operationally, IGO is tracking ok as the Nova production continues to ramp up, and costs continue to fall – although neither seem to be changing at a fast enough rate to beat expectations for the year - just meeting guidance may be a big ask!!! Positives from the update include the continued deleveraging story – debt now down to a measly $73mil – while nickel and gold prices track higher than most market expectations. 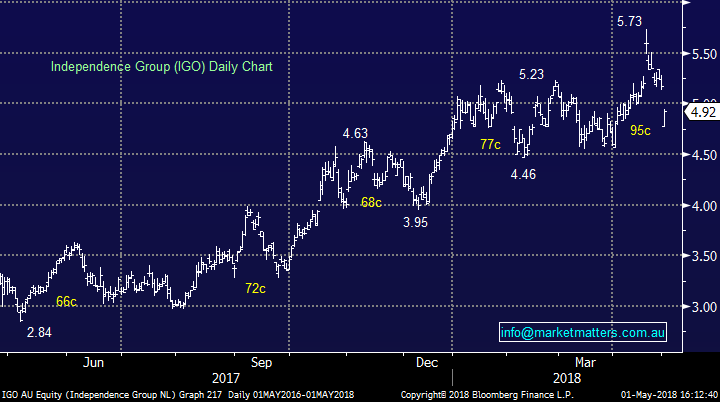 While it is entirely possible that IGO manage a huge 4Q to make up some ground, and commodity prices do their part in bridging the gap in earnings, the 3rd quarter wasn’t up to the market’s lofty standards and the stock was hit. All in all, Independence Group is a good story, with high quality assets and now MM are back on the buy side if today’s selling continues. 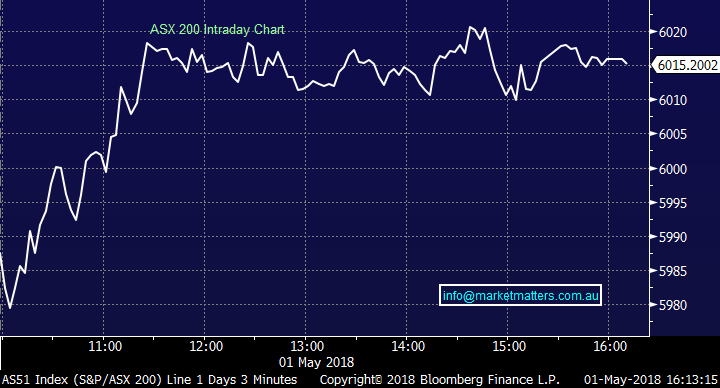 We thought about pulling the trigger this morning, however the stocks had already moved once I got off the conference call that started at 10am. Market expectations will now be rebased overnight and we may see selling tomorrow – a buy around $4.75 would look attractive.